The time is almost upon us! 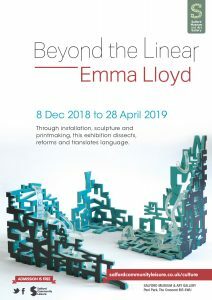 I will be hosting a private view for my solo show “Beyond the Linear” on 12th December (from 5:30pm until 7:45pm). The event is free to attend and will include a unique musical intervention from live musicians as well as a sound collaboration with Luke Hodgkinson. All are welcome to attend and tickets are available through Eventbrite. As beings we take comfort from structure and the organisation of ideas. Nowhere is this more evident than in our methods of communication. Text is the visualisation of language; the simplification of meaning. Superficially ordered to the eye, complexities manifest once we begin to process. What is the context? What is its intention? “Beyond the Linear” exposes subtleties in our exchanges and probes the nature of communication itself. Exploring the cognitive properties of sight through a series of visual puzzles; Lloyd identifies the shift between looking and reading. Content and form merge to complicate and acknowledge language’s accessibility. The diverse range of media on offer invites the viewer to explore the connotations of materials and their ability to shape narrative. Lloyd believes matter to be integral to artistic process since it has the capacity to connect with prior experiences. Such triggers are considered when she examines the impact of the contemporary digital landscape and its effect on us as tactile beings. In an age of marked polarisation and renewed discourse regarding the nature of content and dialogue’s authenticity, Lloyd believes it crucial to investigate the fundamentals of communication. Through this we gain a deeper, more critical insight into how our understanding is shaped and disseminated.